Alright the best thing I can say about squirrels is you love then or you hate them except if you tolerate them. What ever your thoughts below are a few facts about them that may be of interest to you. There are seven families of squirrels and the have over 365 species. There are tree squirrels, flying squirrels, ground squirrels as well as several other squirrel like critters such as prairie dogs, gophers, and groundhogs. A squirrel’s brain is about the size of a walnut, therefore I don’t understand why they are so hard to outwit. Gray squirrels come in many colors. Shades of grey are the most common but they may also be different shades of brown. The pure white and pure black squirrels are both are variations of the gray squirrel. This is not because of natural predictors but do to unfortunate run ins with the automobile. The typical adult squirrel should eat about a pound of food a week. Adult squirrel normally lives alone, in severe cold they will share with other squirrels to conserve body heat. During winter storms, or severe cold, a squirrel may not leave their nest for days the tree squirrel doesn’t hibernate. In late winter anglers would be the most active because this is when mating season starts. Female squirrels will choose the strongest male during mating season. It’s very unlikely though that she’ll ever breed with the exact same male again. This helps to preserve the species by removing inbreeding. Squirrels are often born in the early spring. The average litter consists of four. Based on climate and location a second litter can occur in mid summer. Baby squirrel weighs approximately 1 ounce at birth, are about one inch long they do not have teeth or hair, and are virtually blind to the first 6 to 8 weeks. Squirrels eyes are situated high, and on each side of their head. This allows them a broad field of vision, without turning their head and they ar always watching for predictors. The gray squirrels diet consists of nuts, seeds and fruit, but it is going to eat bird eggs, bugs, as well as fast food if it’s available. Gray squirrel requires some salt in its diet, and might find this salt from the soil along roads where snow and ice may have been. A squirrel will clean a nut by licking it or rubbing its face before it is buried. This action applies a scent to the nut which aids the squirrel find it later, even under a foot of snow. Squirrels communicate via a series of chirps. The frequency, and the duration of the notes communicate everything from laughter to alarm. 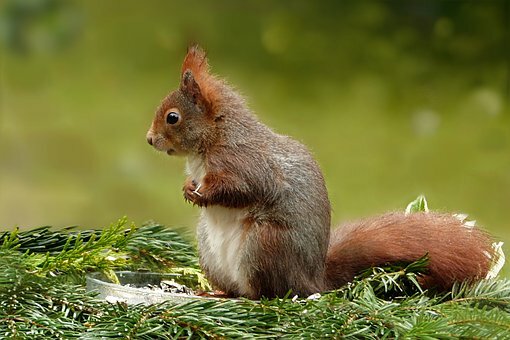 These sounds when used in conjunction with tail gestures, is the way squirrels communicate. If a squirrel has takes up residence in your attic or crawl space you’ll need to trap him to eliminate him. In the summer squirrels are most active for two or three hours in the morning and then for 2 hours before sunset. They will rest in the day by their nests. The squirrels will return to their nest before sunset and will not venture out in the dark. In winter squirrels will do their activities between sunrise and mid day then hang around their nest until the following day. If you have holes in your roof a squirrel can very easily get into your attic and make it’s nest there. You can call a professional wildlife removal company like Centurian Wildlife to have them removed from your attic and the holes sealed.